Actually, despite the line from the original verse, the monument of the Dog on the Tuckerbox lies about five miles (eight kilometers) north of the New South Wales town of Gundagai. Celebrated in Australian folklore, poetry, and song, the Dog on the Tuckerbox, a monument to the pioneers of the Riverina region, has become an icon of Australia's past. One version of the dog's role in pioneering times is that the dog was guarding its master's tuckerbox and other possessions while he sought help from being bogged at a river crossing. The master, a bullocky or driver of a bullock team, never returns but the dog continues to guard the tuckerbox until its death. 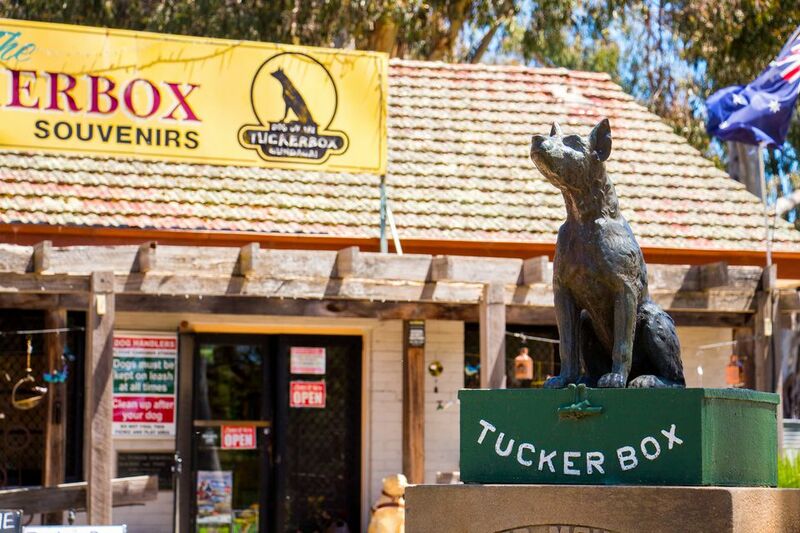 Tucker is an Australian word for food, so the food box the dog was guarding symbolized the sustenance (which needed protecting) of the region's pioneers. These lines of verse are part of the story penned by an unknown poet writing under the name of Bowyang Yorke and published in the Gundagai Times in the 1880s. A later version was written by Gundagai journalist and poet Jack Moses. Both versions speak of a bullock team being bogged at a river crossing nine miles from Gundagai with the dog tenaciously "sitting" on the tuckerbox. The monument of the Dog on the Tuckerbox was unveiled in 1932 by the then Prime Minister of Australia, Joe Lyons, on the 103rd anniversary of Australian explorer Charles Sturt's 1829 crossing of the Riverina's Murrumbidgee River. The monument was the creation of Gundagai stonemason Frank Rusconi, another of whose works, the Marble Masterpiece, is on display in town. Gundagai, 386 kilometers from Sydney, lies along the Hume Highway which runs inland from Sydney to Melbourne.